You no longer need to attach related documents with your tax return. However, retain them in case any audit of the tax return filed is conducted by the revenue authorities. Most taxpayers know that it is mandatory to file returns every year on or before the due date (July 31 for individuals not required to get their accounts audited). Unlike in the past, when related documents were required to be attached with the return, there is no such requirement now. However, it is important to retain them in case any audit of the tax return filed is conducted by the revenue authorities. The most important factor while determining the documents for filing returns is the residential status. People who qualify as "Non-Resident" (NR) or "Resident but not Ordinarily Resident" (RNOR) are required to report their India sourced and/or income received in India. However, individuals who qualify as "Resident and Ordinarily Residents" (ROR) are required to report their global income. There is an additional requirement for the ROR tax payers to report their foreign assets in the tax return. A person who stays for 182 days or more in the current financial year or 60 days or more in current financial year with at least 365 days in four financial years preceding that year qualifies to be "Resident" in India. An individual is regarded as NR, if he/she does not satisfy either of the above conditions. After an individual qualifies as "Resident" during a relevant tax year, he/she is further classified into "ROR" or "RNOR". An individual qualifies as RNOR in India if he/she is present in India for aggregate of 729 days or less in seven financial years preceding that year, and has been a non-resident in India in nine out of the ten financial years preceding that year. If none of the above conditions are fulfilled, he/she would be considered as ROR. For a salaried tax payer, taxes are deducted and deposited by the employer during the year and Form 16 is issued within two months from the end of the financial year. However, it would be prudent to have the same verified with Form 26AS (statement of income and tax records with the tax department), in order to avoid any future litigation due to mismatch in the records. Further, in case of any other income like fixed deposit interest income, rental income, etc., where tax deduction is required to be done at source, Form 16A is issued by the deductor and the verification of the same should also be made with Form 26AS. 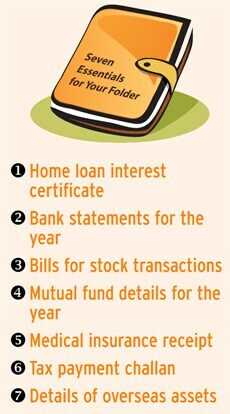 Apart from these, you will also require a number of documents like housing loan interest certidicate, medical insurance cover etc while filing returns. Also, there are some specific expenses like donation, medical expenses for some specific diseases, etc against which deduction can be claimed while computing the taxable income. Receipts for these should be kept carefully. Foreign nationals coming to India for working here or Indian nationals working out of India are required to maintain certain additional documents in order to claim the required benefits in their India tax return. This includes a copy of the passport and travel calendar for the current year and last ten years in order to determine the residential status. Also, overseas tax return is required to claim the foreign tax credit for taxes paid out of India. Apart from this, a tax residency certificate (TRC) is required along with Form 10F in case the TRC does not have all the required information. This helps non-resident tax payers to claim benefit under Double Tax Avoidance Agreement India has with other countries.